I found some great vintage planters at a church rummage sale recently. I’ve wanted some of these forever and a day, but I rarely run across them when I’m out and about. So I was super excited when I spotted two of them at the sale and they were only $5 each. And that included the minister toting them to the car for me. And best of all, they somewhat match my birdbath that’s sitting to the left of the porch. Last year I got tired of cleaning the birdbath ALL THE FREAKIN TIME, so I planted succulents in it instead of using it for a birdbath. This year I decided to give the birds a break and let them use it for a birdbath again. It’s their last chance to prove that they understand that birdbath does not equal public restroom. This time around I added some little pieces of copper pipe (found for way under a dollar each in the plumbing section of Home Depot). It’s supposed to keep the algae and gunk in check and still be safe for the birdies (you probably have copper pipe in your own home’s plumbing). We’ll see how it goes. The rock is just a place for them to sit while they do their business get a drink. Update: It works! I have an update one week later posted here. Love the vintage planters. They have real character. I have to show your hint to my husband – wonder if it works….. I had succulents in an old bird bath last year but I haven’t done anything with it yet this year! truly awesome planters ! what a bargain ! 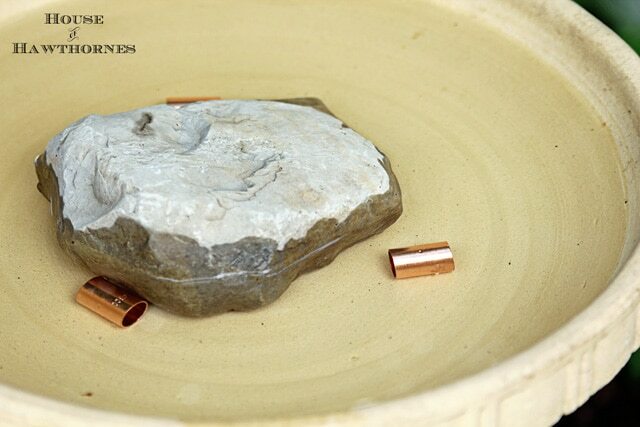 have never heard this hint about copper in birdbaths. Will have to try this ! 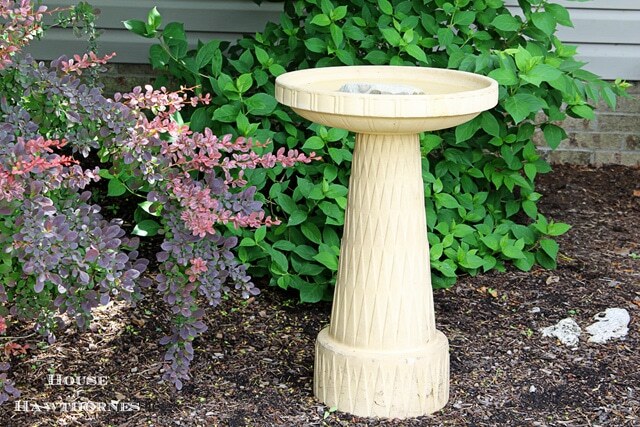 What do you mean–the planters match the bird bath exactly. Keep us posted on copper in the bath. Your pots were a super buy and really nice looking. 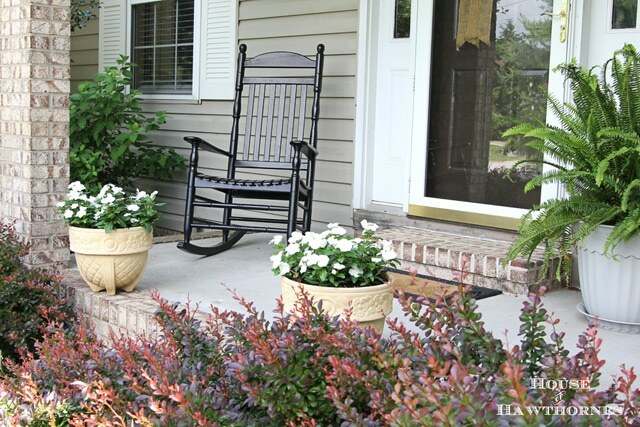 Your shrubs look great around your porch. I think you should have a couple succulents in a plastic pot sitting under the bird bath. Scare those birds into behaving or else it’s succulent time again! Love the planters, you got a deal I never see them for that! The planters are wonderful. I bet they are heavy. Joe always rolls his eyes at me when I find heavy concrete items. You did well on those planters! Also thanks for the tip about the copper, I’ll give it a try! Wow! What cool looking planters! They do look like they match the bird bath! I’ll have to try the copper pipe, too! Those planters are really awesome! Great price and someone to tote them to your car!!! Score! Jealousy doesn’t look good on me, but I am wearing it over those planters!! They are beautiful and that you got a matching pair is amazing. I have succulents in my birdbaths…both stopped holding water. I love church sales, they always have great prices!! Good going! They look really good with your bird bath. 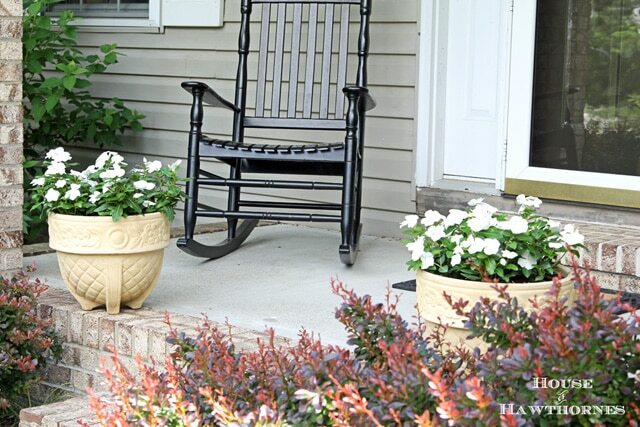 Love your planters, Pam…great find! Looking forward to seeing if the copper pieces work! I’m showing this to Chris. I’ve not heard of the cooper piping technique. Interesting. Please keep us posted. we’ve found some of the best planters at estate sales lately. Love YOURS! The price was fantastic! what a neat shape to those planters, and interesting idea with the pipe. good luck with that! and Third… Copper? really.. you just made my day..I am going to try it with my moms bird bath until I get one of my own..
Dear Pam I love your planters and what a great buy! I know your birds will be very happy! 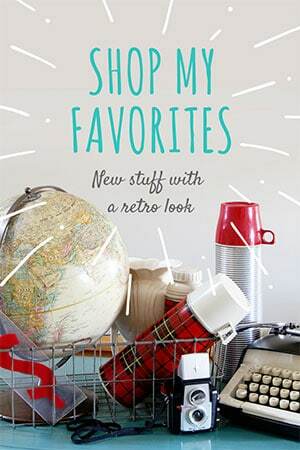 I have one of those pots – you got a great bargain especially the toting part – they are heavy! Hope the birds mind their manners. 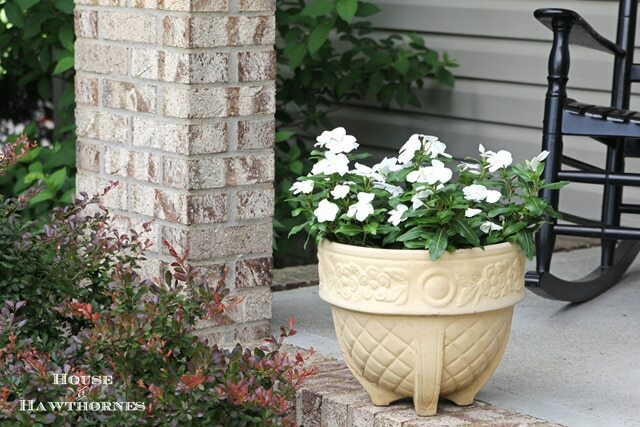 Love those planters–and a great deal too! Great planters and a great price, too! I’ve never heard of the copper theory, but I’m willing to give it a try. My poor birdies are wondering if the cleaning lady quit. I love the planters and the price of them too! Ohhhhh, darling planters. I love them. Great find! Thanks so much for the tip on the copper piping. I’m gonna do that for my birdbath. What a great idea. Also love the stone in the middle! Your planters are wonderful! It looks like they may be from the 1930’s or 1940’s with the design that is on them. 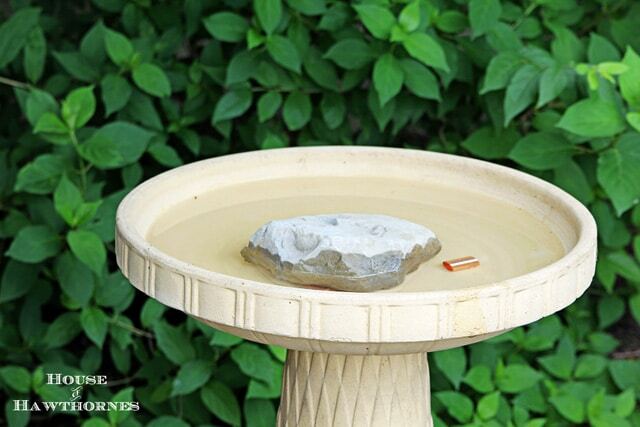 Your birdbath is a perfect match. My birdbath is currently a planter, and I’ve got other bowls sitting around for my dirty birdies. They are easier for me to clean and refill. Next year I may try your copper trick. Nice score on the planters, they look great. I thought I would share my birdbath cleaning ritual. I buy a small bottle of bleach at the beginning of the summer and one plastic handled scrubbers that are used in a sink. I dump the dirty water and splash a glug of bleach in the bath and use the brush to clean. Rinse with water from the hose and done. Bleach dissipates quickly and doesn’t hurt the birds. Perhaps this will help someone. The birds really appreciate water for drinking and bathing. I have never seen vintage planters like that before. They are fabulous and the price was awesome! They do look nice with your birdbath. I am going to have to try the copper in the bottom of our birdbath. It gets so gross sometimes! Thanks for sharing. I never heard of the copper pipe trick. It’ll be interesting to see if the copper does help to keep the algae down. I love the planters , but have heard about copper not letting bacteria grow. I think there is a new company in mobile alabama that has the copper set up for keeping swimming pools clean. I tried the pennies in my birdbath but was told they had to be 1982 or earlier. This definitely works but glad to know I don’t have to dig for all those old ones. As soon as I can find a bowling ball will cover it with all those other pennies I have. 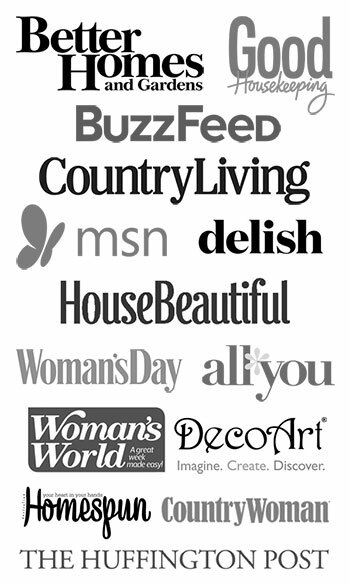 Love the ideal. Even have an old bird bath base for placement in my tiny little garden behind my condo. Thanks for the ideas.